CS Leasing offers a new fleet of the most advanced powder tanks, with three design options to maximise compatibility for our customers’ operational needs and efficiencies. 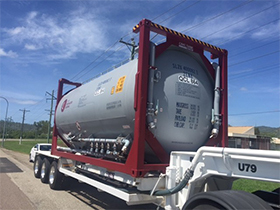 With our standard ISO tank design, our powder tanks are compatible with existing marine and intermodal transportation infrastructure – eliminating the need for costly and time-consuming cargo transfer at transportation hubs. Our special fluidisation membrane matting provides flex to the tank barrel cones, resulting in more effective discharge than conventional designs. As a result, our powder tanks have become the preferred choice for leading construction and mining companies with three different design options on offer: accommodating a wider selection and solution for project work, whether units are needed for transportation by road, rail, sea or to be loaded and operated stationary at remote work sites. Qld Work Safe - Certificate of Registration of Plant Q29734 - 3 cone with fluidisation matting and ground loading.